The Zebra ZXP Series 3 Black Monochrome Ribbon K (item# 800033-301) is ideal to print sharp black text or images on your ID cards and badges. Ideal to personalize pre-printed cards, the Zebra ZXP Series 3 Black Monochrome Ribbon K offers 2,000 prints per roll. As a result, you get more prints at a lower cost per card. You will also increase your card production rate and therefore maximize productivity. The Zebra ZXP Series 3 Black monochrome ribbon is eco-friendly: the cartridge and core contain a special additive that speeds up biodegrading. The ribbon cassette is made with recyclable plastic for a lesser impact on the environment. For easy maintenance, this ribbon includes a cleaning roller. 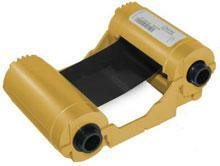 The Zebra ZXP Series 3 Black monochrome ribbon is for use with Zebra ZXP Series 3 card printers.